Have you ever walked into a party only to realize there is someone else wearing the EXACT same outfit as you? As soon as you see them you get a sinking feeling… You know that for the rest of the night you’ll be the going joke. Unfortunately, this is something we have to live with. The people we socialise with tend to shop in pretty similar places, and those places have a limited amount of styles to sell. So it’s not totally crazy that you could end up wearing the same thing as someone else at a party. This is what has happened with SEO. Everyone is shopping for keywords in the same place, and subsequently everyone is chasing the same search engine traffic. You come up with an idea for a piece of content, go to Google Adwords, and check to see what the best keyword is for that topic. Then you create a blog post or web page about that keyword. It’s not a bad strategy. 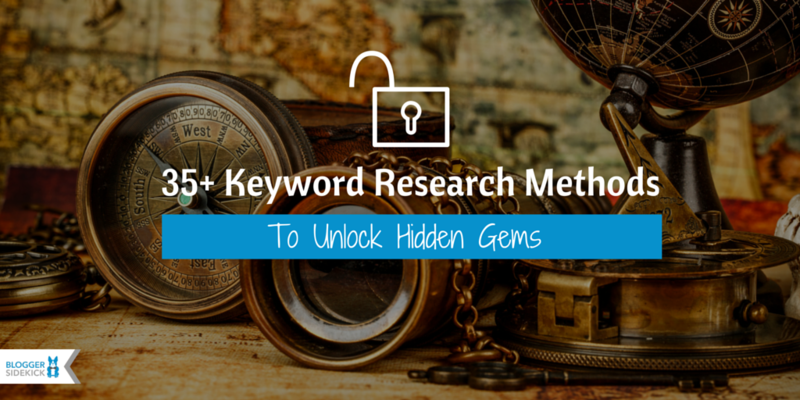 How good would it be if you could find hidden keyword gems that your competitors had never heard of? Keywords that would help you compete for rankings and traffic with underdone and outdated content? Keywords with little to no competition? Yea I know, those questions are rhetorical – it would be totally awesome. But instead of dreaming about it, I figured I’d do something to help you out. I went about collating every single keyword research tactic I could find. It’s left me with this ultimate list of 35+ keyword research methods you can use to find high-performing, low competition search terms. These four reasons are WHY keyword research is so important – despite it being slightly tedious – you will reap the benefits in the end. Ok you get it, keyword research is important… How about those 35 secret tactics then? Here goes. Google Suggestions is a quick and easy way to find keywords related to the words you are already targeting, and pinpoint long tail phrases. It’s as easy as typing a potential word into the search bar and letting the automated suggestions popup below. The Google Search Console, or “Webmaster’s Tools” as it is commonly referred to, can help you figure out which keywords your site is already ranking for. On your dashboard, click “Search Traffic” and then “Search Analytics”. From this screen you can choose to view the data based on “Clicks”, “Impressions”, “Click Through Rate (CTR)” and “Position (Ranking)”. Why should you care about your current search traffic when it comes to researching keyword opportunities? This data is extremely valuable in planning your SEO strategy and figuring out where you can make improvements. For example, perhaps you are getting search traffic for keywords you had never thought of – it may be worth further pursuing these topics or finding long tail phrases to target. Alternatively, maybe the keywords you WANT to rank for are not delivering you any traffic, or they are so far from page one that no one is seeing them. If these topics are important to you, can you turn this performance around? If not, what similar keywords could you target instead? Ok, ok… I know I criticised this keyword research tactic in the intro, but it’s still a core part of an effective strategy. Because it offers direct insights from Google, and that’s where you want to rank your content. 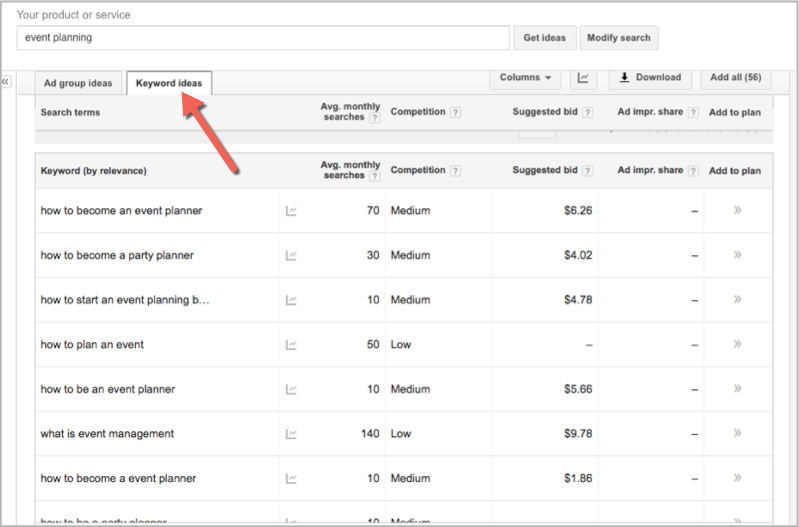 Even if you choose to use any of the other 35+ keyword research methods in this list, the Adwords Keyword Planner is a great place to validate your findings and check search volume, competition and other valuable statistics. You will also notice in the “Keywords to include” section, I’ve added the words “what, where, why, when, who, how, can, should”. These are typical question related add-on words and will improve the quality of the keyword ideas the planner delivers to you. Instead of generic words such as “event planning” and “event planning sydney” it also produces more specific long tail phrases such as “how to become an event planner” or “how to plan an event”. 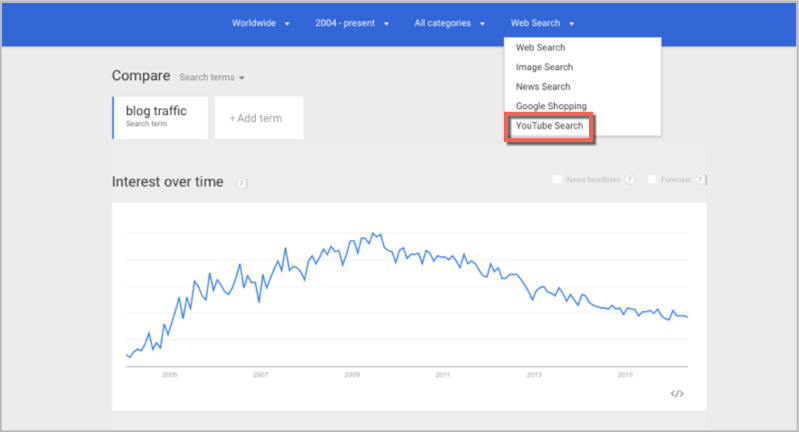 Google Trends shows you the interest over time for a keyword, which can be valuable in deciding whether or not something is worth targeting. 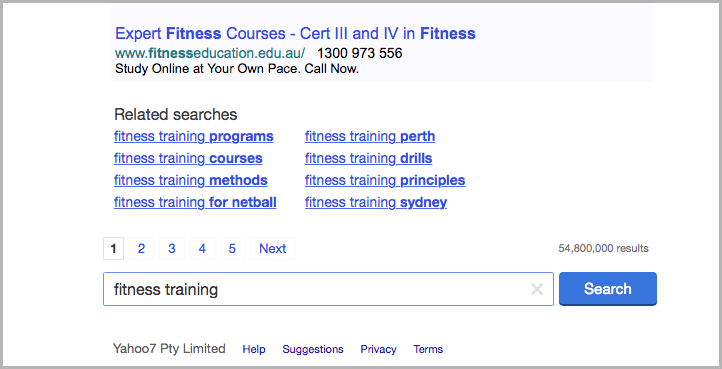 It also shows you related searches that might not show up in regular search – this is often an untapped opportunity. For even more insights you can click on the “Rising” tab to see how each search term is trending, and whether it is on the way up or down. Google Books is a huge index of books from the past 100 years, and is a unique way for finding potential search terms. To use this keyword research tactic, go to Google Books and find a book that is likely a good resource for your chosen topic or industry. For example, I searched for “puppy training” and discovered a book called “The Ultimate Guide to Dog Training“. Yahoo Search is another often overlooked resource for keyword gems. On the side bar, you’ll see ads related to your search. These can be a goldmine for related or similar keywords, because other people (who are paying money for these slots) have already done in-depth keyword research. A valuable resource for keywords, with more than 7 years of question and answer data, is Yahoo Answers. In this example, most of the questions are about what an organic garden actually is, and what tools you need to get started. You can test out these phrases and questions using the Google Adwords Keyword Planner to see if people are searching for them. Even though Google holds a whopping 93% of global and and 83% of US search traffic, Bing can provide some hidden keyword opportunities. The best thing is, MOST of your competitors probably don’t even know what Bing is. The Bing keyword research tool operates in a very similar way to the Google Adwords keyword planner. You can export the entire list as a CSV or Excel file and use the impressions to find valuable keyword opportunities to target. Udemy is an online education marketplace with over 30,000 online courses… Who would’ve thought it is a goldmine for keyword terms? To find keywords using Udemy, start by looking at the top courses in a category related to your industry. You can further filter this search depending on your audience. For example, on the left hand side there is the option to sort by price and education level. You can also have a look at the curriculum of the course to find other topics that may be important to your audience. Use these topics to deepen your keyword research. Ubersuggest is a keyword research tool that works by scraping Google’s autofill suggestions. Quora is a question-and-answer website with a growing community of members from all walks of life. Your customers are going to Quora, and they are typing in questions for people to answer. Those types of questions are also very similar to the words they will type into a Google search. To find keyword opportunities, open Quora up in your internet browser and search for your main topic. This is what the Quora search looks like, I have searched for “email marketing” and you can see a whole bunch of popular questions that include that term. 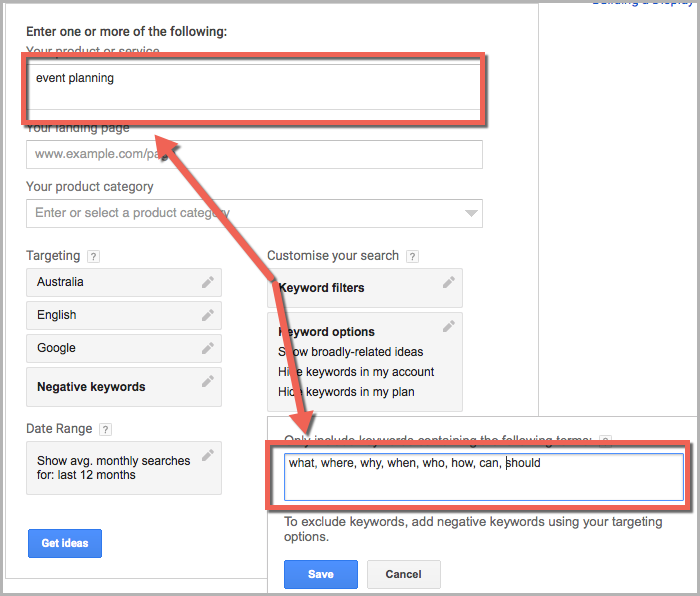 By themselves these questions might not be much help, but you can discover potential keywords based on these questions by using the keyword planner in Google AdWords. WebpageFx is a tool that will help you find keywords by scraping threads on popular forums and site aggregators such as Reddit. This search will deliver a list of keyword phrases that relate to questions people are ACTUALLY seeking answers for online. Chances are, if they use this type of language in forums, they will use it when they go to Google as well. Soovle aggregates keywords from Amazon, Wikipedia, Ask.com, Google Suggest, Bing, Yahoo and YouTube. Many of these keywords might have been overlooked by your competitors. Wikipedia can be a virtual candy store for keyword opportunities. Keywordtool.io is a good alternative to Ubersuggest that generates long tail keywords from Google’s Autocomplete. It extracts suggestions based on keyword popularity in search, as well as other factors. If you upgrade to pro you can unlock other important metrics such as competition, cost-per-click and search volume, plus access a longer list of keyword suggestions. Pinterest is a worthwhile keyword research method considering its users spend on average 126% more time online than Facebook users. Social media is a real-time place to learn about the latest trends in your niche as well as your audience’s needs and desires. To find keywords, you can use the Twitter Advanced Search to see conversations about your industry and the topics your customers care about. I’m sure you get the point… All of the popular social networks are a largely untapped source of keyword opportunities. Just start digging and you’ll find some diamonds. Just like you did with Google Books, Amazon product descriptions and reviews are a a killer spot to find keywords your customers may be interested in. Next, do a little something called “Review Mining”. Jump into the reviews of this product, luckily there is 268 of those for Russell’s book. The customer question and answer section that many products have on Amazon is another place to find relevant keywords. Optimizing your site for comparison terms can be a valuable, untapped keyword strategy. Many brands aren’t brave enough to optimize for a term that includes their competitor’s name, but you do have the unique opportunity to capture traffic from people who are generally at the bottom of the sales funnel and ready to buy. That makes it an excellent place to mine for keyword gems. The Google Keyword Suggest Tool from SEO Chat will show you suggested searches from Google, Bing, Amazon, and YouTube. You can export your results, or go even further down the rabbit hole with “Run Part 3 Useful Suggest”. This keyword research method is great for digging deep into keyword relationships. SEMRush will help you see what keywords your competitors are bidding on in paid search, AND the keywords they are getting organic traffic from. You can export all of this as a CSV if you are a registered user – extremely powerful stuff! Rand Fishkin announced Moz’s latest release the “Keyword Exporer” on the 3rd of May 2016. That makes it the newest tool on this list. Keyword Explorer is a natural place to kickoff your keyword research. You can filter your search results based on the metrics that matter most to your business. Answer The Public is a tool used to generate content ideas based on a target keyword, but it can also be helpful as a keyword research method. You can use this tool to find keywords that your customers and prospects actually search for, instead of guessing. Once you’ve got enough responses you can download the data and see what Google results show up based on your contacts ideas. If you’re a blogger using WordPress, SEOPressor is a helpful keyword research tool. It analyzes your content and makes suggestions for how you can better optimize up to 3 keywords, a little bit like Yoast SEO. The tool displays suggestions for closely related terms to your primary keyword, known as LSI keywords, that you can include in your content. Power Suggest Pro aggregates keywords from six major search engines. It’s another one of the intriguing paid options when it comes to keyword research. Plus it has things such as geo-targeting, hashtag search and a bunch of other cool features. 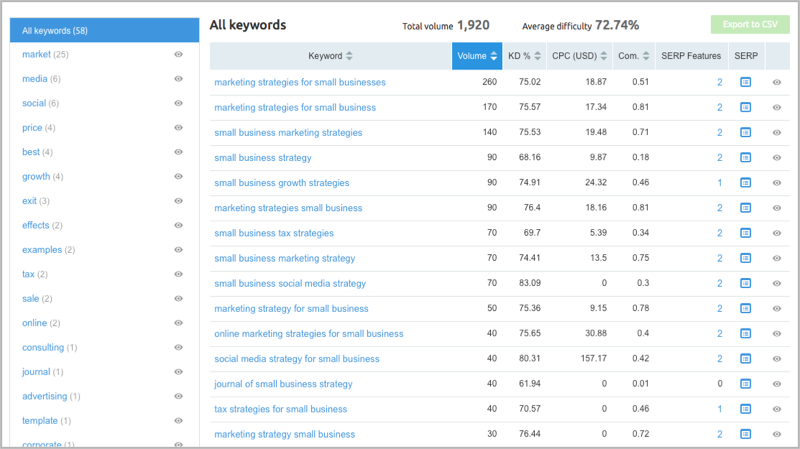 SpyFu is another interesting tool for analyzing the keyword strategy of your competitors. It provides tons of valuable data such as organic and paid competitors, shared keywords, top keywords both organic and paid, ranking history and a break down of inbound links. Long Tail Pro is a favourite tool for many bloggers and digital marketers… And it’s not only because they have an affiliate program! You can discover keywords based on Domain Authority, Page Authority, and other important metrics. It allows you to extract up to 800 keywords per primary topic, and get insights into what people are searching for each month. 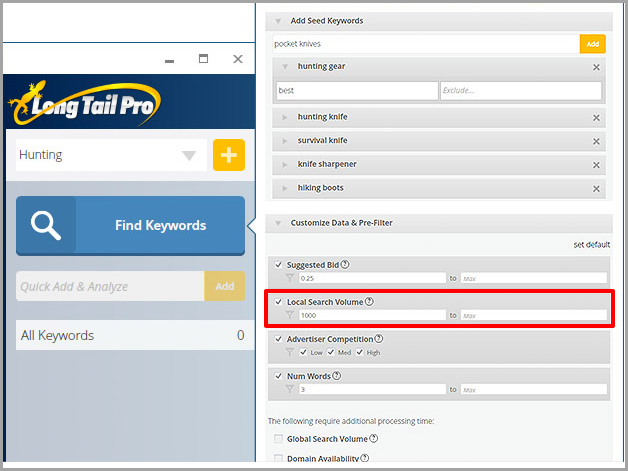 One of the interesting things about Long Tail Pro is that you can filter your results using a big range of metrics; such as suggested bid, local searches, competition and search volume. SEO can be frustrating… Especially when you’re stuck competing for all the same keywords as everyone else. With a little bit of creativity and a couple of left-field keyword research tactics, you can discover some pretty exciting opportunities. Before you know it you’ll be ranking your content where people actually see it, AND your competitors probably won’t even know it’s happening. Keyword research is time consuming, but it’s definitely worth the pain. Instead of coming up with a topic and figuring out what keyword to optimize it for every time you post… Do your keyword research in one big chunk at the beginning, and map out a strategy for the next 6 months. Or if you don’t want to do it yourself, put together a brief and outsource the research. It’s highly unlikely you will use all of the keyword research methods in this post, but pick the ones that make the most sense for your situation and give them a go. What have I missed, do you have any other tactics for finding hidden keywords?